Friday, January 15, 2010: On the road and continuing north on US-90. It is 54 degrees and raining. Almost immediately we were stopped at a Border Patrol checkpoint. Now, coming off a road that leads directly to the Mexican border and towing a 22 foot trailer I just knew we would be searched. Nope, the nice agents chatted with us for awhile and sent us on our way. They must have been impressed by my mastery of the Spanish language. 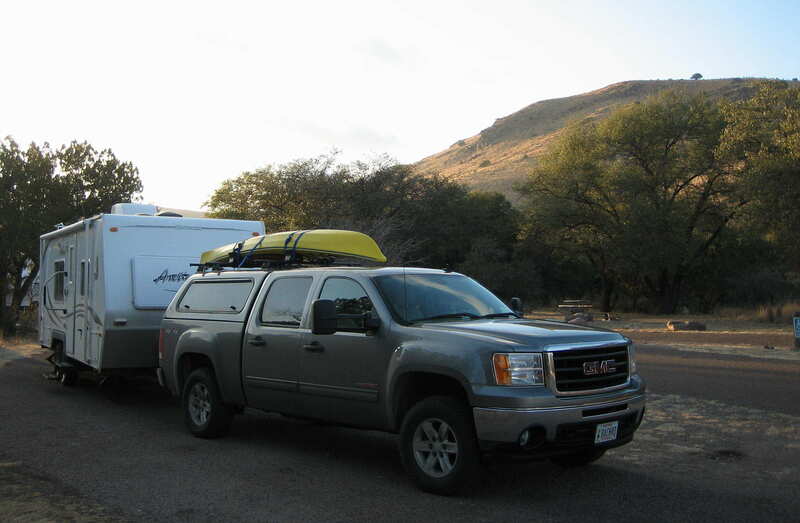 Passed the turn off for Seminole Canyon State Park where we stopped to explore last year. Great park and campground; if interested in seeing our time there please refer to our 2009 Journal #18 which is archived at http://www.bilnkit.com. It was kinda otherworldly, as the weather cleared there were shafts of light that shown through the clouds which illuminated our rig and made the surrounding prairie grass glow like gold. I expected to hear angels singing at any time. Rolled through Sanderson, Texas…..a nice little western frontier looking town. Many old adobe and wooden buildings. Purchased gas at Uncle’s Store and noticed everyone was wearing cowboy hats, driving Ford F-350 trucks with brush guards which had Farm Vehicle license plates. Obviously we stuck out like a sore thumb. Why does a sore thumb stick out anyway? Seems it would be more vulnerable to injury…..that’s odd. We joined the Texas Pecos Trail, so named due to the fact that it is in Texas, it crosses the Pecos River and that the Texas Tourist and Information Bureau thought it sounded more interesting than Highway 90. Noticed a sign that said “Entering the Chihuahuan Desert”. I believe it was named after the little Mexican dogs that grazed in these parts. Kit looked intently, mile after mile, at the 3 foot prairie grass for signs of the critters…..but no luck. They must be nocturnal. Rolling along at our usual 60 MPH heading west on TX-90, oh…..excuse me, The Texas Pecos Trail, I cycled through the readouts on the trucks information center. I usually do this a few times a day to check tire pressure, miles left on remaining gas, Average MPG, transmission temperature and trip miles for the day. When I came to average MPG I took a double take. 7.2 MPG!!!!! Our usual is 10.5 MPG. Then Kit who was online checked the weather…..we were battling 35 MPH winds coming out of the west. The effect on the truck and trailer was like doing 95 MPH! I was tempted to turn around and drive in reverse the rest of the way!!!! Decided to pull into the Davis Mountain State Park for the night. We stayed here last year for a few days and really enjoyed the place. Check out our time there in our 2009 journal issue #19. We took a walk up to the Nature Center where there are a number of bird blinds set up around the feeding and nesting areas. The Davis Mountains is famous for the variety and quantity of wild birds. Sitting in a blind I noticed some movement in the bushes and what do you know, this fellow popped out. 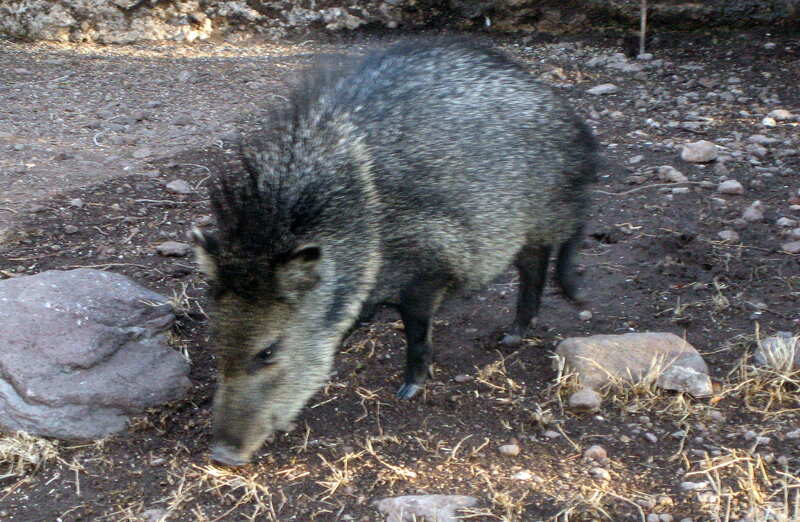 It’s a Javelina, rooting around for dropped food below the various bird houses and feeding stations. It didn’t even notice us and was intent on, um…..well, just making a pig out of itself. Frankly I thought the Javelina was more fun to watch than all the birds flittering about. But I guess that makes sense because back home I like to watch the squirrels perform gymnastics to get to the bird feeders…..I’m just strange that way…..actually I guess I’m just strange in a lot of ways. It is now 0200…..we are at a campground at over 5000 feet…..it is 22 degrees! Yikes, got dressed, went outside and disconnected the water supply. The water faucet was 90% frozen as was the hose. After managing to shut off the faucet I disconnected the hose, brought it inside and placed it in the shower stall. The sky was clear and I quickly admired the plentiful and very bright stars in the dark night sky. Feeling chilled, I quickly jumped back into the warm bed. After Kit stopped yelling we were able to drift back off to sleep. Saturday, January 16, 2010: Woke at 0600, made coffee, reconnected the water hose and took a walk around the park. The sun was coming up over the mountains and the temperature was rising rapidly. Everyone I met on my walk complained about frozen hoses and no water. Guess it was worth the effort to get up at 0200. On the road at 1045 and the temperatures have risen to 46 degrees. Passed by the Macdonald Observatory and noticed signs for visitors center and overnight star parties. Another “must do” for our Life (Bucket) List. Maybe next trip. Jumped on TX-118, The Texas Mountain Trail, and headed northwest. Drove through some spectacular mountain scenery topping out at 6,218 feet. 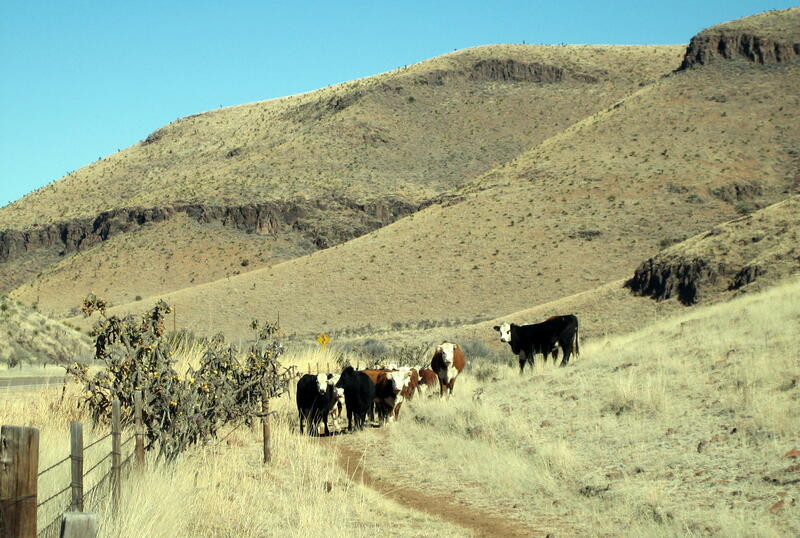 Entered a high meadow which contained many cattle grazing on the prairie grass. Stopped to use the “facilities” in the camper and these fellows visited us. 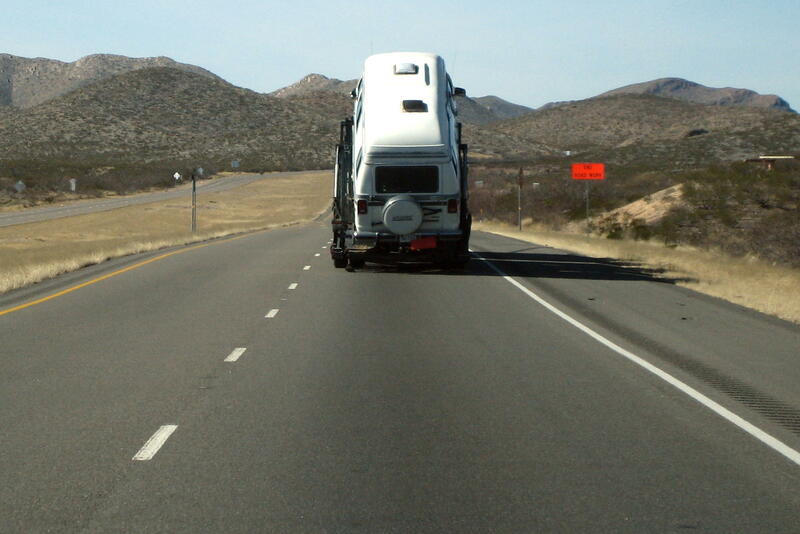 I’m thinking it’s a camper van getting frisky with a large truck…..I bet that’s where all the huge motorhomes we have been seeing come from. In order to give them some privacy we backed off. Crossed over into New Mexico around 1500 and started climbing into the high desert area. As we reached the 4000 foot level we started noticing snow in the surrounding mountains. Will we ever get to a warm (anything above 60 degrees) and snow-less place? 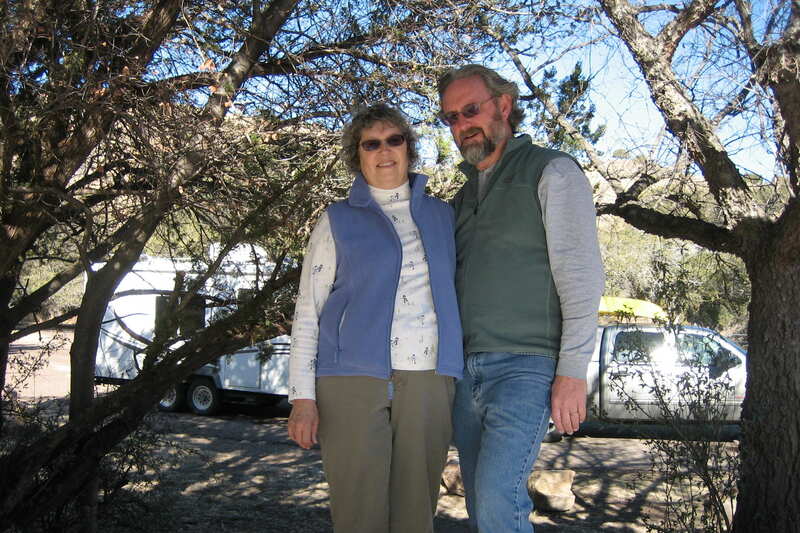 Kit’s Corner: Very nice ride from Davis Mountains State Park to Alamogordo, NM. One thing that happened is, when we stopped to visit the cows, we noticed a smell of propane gas in the trailer. Evidently, when Bill made coffee earlier, he didn’t turn the burner entirely off. Fortunately the safety feature shut down the gas flow and only a little gas escaped. We opened all the windows so lots of fresh air to come in and all was fine after a few minutes. Have to add “checking stove burners” to our departure check-off list. I have to tell you, your stories are great! I am getting such a kick out of reading about your adventures (Craig needs to catch up!) … Bill, you are quite the storyteller! Reminds me a little of when we took two weeks to mosey from San Diego to the East Coast … but we had no trailer, so it was motel to friends to motel. The scenery was absolutely gorgeous! Ah, to be retired … we are so envious!! Sounds like you are having a ball … ENJOY!! Thanks for the nice comments…..looking forward to seeing you all in the spring!